Missed it by THAT much . . . okay, missed it by a mile. We live by a pumpkin patch and I love to look over our deck in the fall and see the sweeping fields of orange. I like it even more in November, when the cows are turned out to chow on some pumpkin pie. 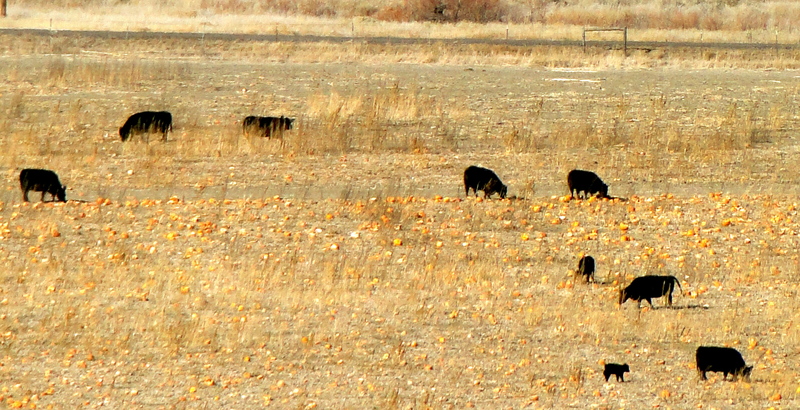 With multi-tasking in mind, I thought I’d take my camera on my run this morning so I could post the perfect pastoral shot: Flatirons in the background, a few golden leaves still clinging to the cottonwoods, and the striking contrast of black cows and sunlit pumpkins. One problem – going on a run with a bulky camera didn’t sound like my idea of a good time. My bright idea was to leave the camera at home and take my iPhone instead. That way I could still take the picture AND listen to my playlist. I have to have music loud enough to drown out my breathing when I run, or I freak myself out because it sounds like I’m dying. I was a weensy bit worried about how the shot would turn out because I don’t have the fancy new iPhone with the cool zoom, but I didn’t let it stop me, since the cows are usually close to the fence. Off I went with Cappy the dog and a hat and gloves because it was a nippy 40 degrees. I was clipping right along when out of the corner of my eye I saw a flash of grey. There, headed right toward me was a coyote with a fat prairie dog in his mouth. I froze in my tracks, thinking what a cool shot it would make. Well, maybe not so cool for the prairie dog, but still. . . I reined in Cappy, ripped off my gloves, and now the coyote was crossing the trail just twenty feet away. Wait! I sent him a telepathic message, because coyotes are tricky like that. I don’t want your prairie dog. Just a quick picture! And you know what? He stopped RIGHT in the trail with that dead varmint hanging from his choppers and posed for me. I fiddled frantically with my iPhone, trying to get the heck out of my playlist and find the camera mode and then wait for it to load. When it finally did, Wily E. had lost patience and was trotting away to have his breakfast. At least I still had the cows. When I finally reached my destination, I ran into another glitch. The cows were way out in the middle of the field, nowhere close to the fence and there I was with no zoom. I seriously considered crawling through the fence and marching out to the middle of that field so I could get the shot. But I have bad cow karma. Besides eating them, when I was a kid on the ranch, our idea of a good time was making the mama cows so mad they’d chase us up trees. One time, a particularly enraged cow managed to get her front legs up into the base of the ginormous willow where we thought we were safe. Scared the vinegar out of us. If I dared to take my dog and sneak up close enough to get a decent shot with my cell phone, with my luck one of those cows would be the great-great grandchild of the ones we’d terrorized back in the day and her DNA would tell her to mow me down. So, epic fail on all accounts. I did, however, dig up one from last fall that I took from our deck with a real camera and not my relic of a cell phone with no zoom or cool features. Guess what I’m asking Santa for this Christmas? This entry was posted in Uncategorized and tagged cows, coyote, iPhone, photography, Prairie dog by Beth Christopher. Bookmark the permalink. Hi Beth, Cute story – I can just picture it all happening. But. I’d better go get dinner ready for the guy who’s going to hear about what you want for Xmas. Mom C.
Oh my goodness Beth, you gave me a mental commercial break with your story!! The way you speak and write is always Bethoetic (mixture of Beth and poetic) and it is entertainment at its best!!! Thank you! I love this, laughed out loud, made my night! Thanks, Carol. Am loving your blog and you’re not even in Oz yet!